﻿﻿One of the key elements of a successful TU Chapter is an effective program in Conservation is to improve cold water resources by engaging in projects such as stream restoration/clean-up. Because, the stocking of the streams of Delayed Harvest begins in October, BRTU members are urged to participate in stream cleans. (The fish and would like a clean stream). ​Click the button below for sign up form and detailed information about this event. North Carolina is rich with angling history and holds a special place in the hearts of many anglers who have fished its treasured waters. 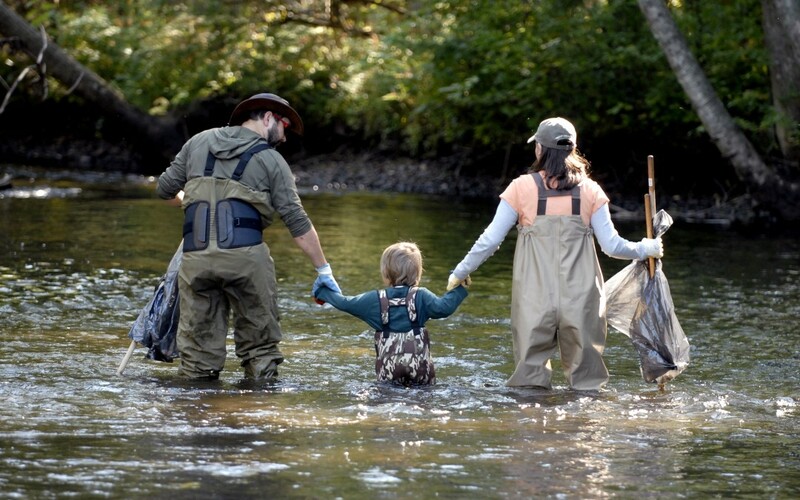 From mountain streams to large rivers our state is filled with more than 3000 miles of fishing opportunities. However, many of these places are at risk and face a number of pressures from overdevelopment, agriculture, energy development and other stresses. Over the years trout have endured and adapted to threats to their survival. There are many chapters of Trout Unlimited; our goal in this immediate area is taking steps to conserve these at-risk resources and improve habitats to ensure the fish have opportunities to not only survive but thrive. There is always help needed in stocking streams like the Ararat, Mitchell, and Stone Mountain. Organizations like Trout in the Classroom assist NC Wildlife Recourses Commission by raising and releasing trout each spring. Check our information page for upcoming spring release dates. As you are fishing your favorite spots, keep an eye out for any signs of disease or odd behaviors. The NC Wildlife Resources Commissions asks that you inform them of any signs of gill lice or whirling disease. After your inspection, please release the fish back into the same area as to not spread any diseases! If it doesn't belong, just pick it up and take it with you. Removal of trash in and around our streams conserves and beautifies the area for years to come. Add a small trash bag to your list of fishing gear so you'll easily be able to dispose of trash you see along the way. Want to help? Click the image above to enlarge. North Carolina Wildlife at 1-800-662-7137. Needs - trail runoff due to hiking, mountain bike riding, ATV's, etc. Help build berms. Potential destruction from heavy rains, agricultural and industrial runoff. Preservation of habitat for wildlife such as hellbender salamander. Promoting and teaching fly fishing in the schools that have Trout in the Classroom. On Wednesday and Thursday of this past week (15-16 June 16) I helped a team of VDGIF fisheries biologists sample the health of the fishery. This was the 2nd time we have used the new sampling raft which is now assigned to the Region 2 Office located in Forest VA. That’s my ride on the left – they brought a canoe and third biologist who in addition to trying to keep me from getting wet helped with fish processing and swapped roles with the others because working the net in front of the raft gets tireing in a hurry. The plan was to sample from below Martinsville Dam to the Sports Complex on the first day. We were accompanied by a couple of observers from DRBA . This worked out well because they kept us on the correct side of the river in spots where things could have have been a little dicey – In those spots they took the lead and then turned to watch as we worked down a set of rapids. I had the feeling they were hoping I took a swim but my pilot got us through safely. They also offered to provide the shuttle which allowed us to get on the water sooner then otherwise expected. Once the livewell (100 qt cooler) was full it was time to find a spot out of the current to process the fish. Each fish is identified, measured and checked for general health. We have marked and moved several thousand fish from overpopulated areas up near the dam to the lower river where there is more food – many of them were collected for a 2nd time on this sampling and appeared to have significant gains in length and girth. All of this data is eventually entered into a computer program that combines time spent in each collection, times number of fish collected along with measurments and eventually spits out data that indicates the health of the fishery. It’s then on downstream for more of the same until the cooler once again has as many fish it can hold without injury. The river was running pretty fast in spots. There was also a lot of color to the water although it had not rained in several days. Each run collected a good number of fish but the number collected was probably less then 20% for that particular section. The electronic field is only about 6 feet wide and only goes down a few feet. Witrh the water being dingy the netter only got a quick stab with the net before many fish disappeared from sight. We did collect some very nice fish – several pushed the 20 inch mark. Last year VDGIF stocked several thousand fingerling triploid brown trout and 8000 again this year, all in the lower river downstream of Martinsville Dam. We collected a good many 6-7 inchers from last years stocking and several 4 inchers from just a few weeks ago. Granted, most will end up as food for the existing larger trout but triploids that survive do not reproduce and have a quick growth gene engineered into their fabric. They should give the lower river a shot towards becoming a very fine brown trout fishery. After the third collection of the morning we pullled into a good spot for processing those fish and an impromptu “shore lunch” – That’s when disaster struck. Many of you are farmilar with the old fishermens warning about “never bring bananas on a fishing trip” – I’m not saying that is what happened but one of the biologists who will remain unnamed pulled out, peeled and ate a banana. We got all lined up for the next run and low and behold the generator stopped putting out electricity. At first they thought it was the control box but another was retrieved, thanks to shuttle service provided by or DRBA observers, but things still did not work. With no back up generator there was nothing to do but row downstream over lots of unsuspecting trout to the Sports Complex “get out” point. On the positive side it did give Smith River biologist George Palmer a chance to practice his paddling skills without fear of tangling the expensive electronic probe arms in an overhanging tree branch. The Sports Complex ramp is really a series of metal steps which makes use by anything other than a kayak or canoe a special challenge. Biologist Tyler Young has come up with a rope system that attaches to both sides of the rear, forms a V under the raft and comes out the front – it still requires a lot of muscle power but it works. With the equipment on the fritz the following day’s plan for more sampling was put on hold. Two of the biologists returned to the office with the raft and broken generator. George Palmer and I linked up to place water temperature loggers (monitoring devices) at strategic spots throughout the river. These loggers are set to record the temperature at 15 minute intervals. George will return every 10-15 days (more often if we have a real hot spell) to download the data for analysis. This data will be shared with the COE so they can make adjustments in the water flow in an attempt to keep the fishery below 75 degrees to avoid a fish kill. VDGIF and SRTU are discussing a plan to obtain additional loggers which SRTU can place, download and send the results to VDGIF – this will eliminate the need for a biologist to drive 2 hours one way. It will also provide more frequent monitoring. Once the repairs are completed at the dam we can get back to normal. The question now is what will that “normal” look like. Hopefully the cold water fishery will survive and perhaps even flourish during these times of continuous flows without temperature spikes – only time will tell. In the meanwhile there are discussions going on about a controversial weekend water flow program. Unfortunately this has become a wedge issue between fishermen and paddlers. Thursday evening many of us attended the 3rd and final public input meeting concerning this plan. The local newspaper provided a pretty good summary of that meeting - http://www.martinsvillebulletin.com/news/use-of-river-still-is-under-debate/article_629a13ea-342f-11e6-9f1a-07a5906900f9.html As a long time advocate for the river I hope we can arrive at a compromise where everyone can obtain a little of what they want.